Product #17185 | SKU 2-144-0005 | 0.0 (no ratings yet) Thanks for your rating! 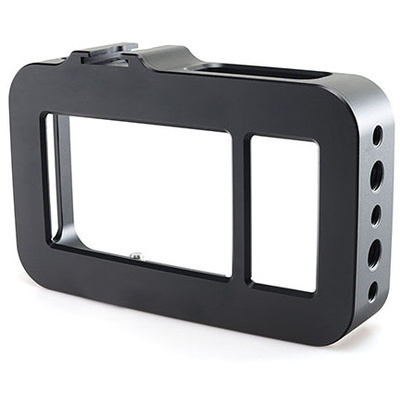 The retroFlex Cage for Blackmagic Pocket Camera from Redrock Micro provides added protection, stability, and accessory mounting threads for your Blackmagic Pocket Cinema Camera, while leaving access open to all camera functions. The camera attaches to the cage via a top and bottom 1/4"-20 threaded screw and rests flush against the backplate to assure the camera remains straight in the cage. The cage adds nine additional accessory mounting points, consisting of six 1/4"-20 threads, two 3/8"-16 threads, and a cold shoe mount. The open-face design of the cage keeps the camera's grip accessible to allow for easy and secure handling. It also leaves the area around the lens mount open, so it won't interfere with any lens mount adapters. The optional wireLock accessory can be added to provide a locking mechanism for each of the five cable connectors on the Pocket Cinema Camera. This is especially useful when using an external HDMI monitor or recorder. The retroFlex cage also serves as the foundation for other retroFlex accessories, including an optical viewfinder and pistol grip with integrated start/stop button. An integrated metal frame on the rear of the cage is provided for quickly adding or removing the retroFlex Optical Viewfinder.